I want to personally thank you for stopping by to look at my work. 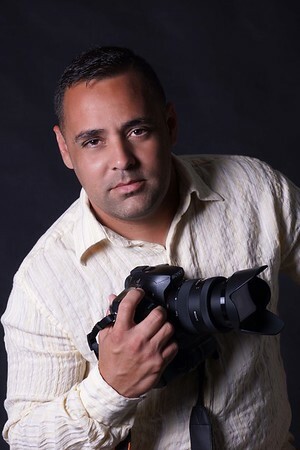 My name is Ernesto and I am self studied photographer. I started in this great art of photography as a hobby years ago, but my thirst for getting the very best of every picture made spark my passion for photography. I enjoy every aspect of photography and thrive for the best lighting, latest photography equipment, and first and foremost my absolute 100% clients satisfaction. I am based in Miami, Florida and can be booked to travel to the location of your choice, I am just one phone call away! I cover from personal portraits, family portraits, runway modeling, events, kids, lifestyle, pregnancy, fashion, weddings and boudoir. So now a little about the human being creating behind the camera. I am happily married to a beautiful woman, inside and outside, with 2 handsome boys and a gorgeous girl. I am very much a stay home guy, I enjoy being with the kids and watch some good movies. I like the latest "gadgets", yup I am a geek when it comes to that; and that also applies to having the latest photo equipment. I have a Bachelors in Architectural Studies from FIU dated back to 1999, and later on, I got my LPN. That's right, I'm still an active nurse. Bottom line, I am pretty much just like most of you. I am a human being with a camera and lots of creativity waiting to be spilled on the next job. I truly hope that it will be you. Please contact me and I will provide you with a quote. I look forward to hearing from you.